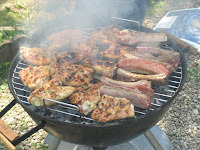 To celebrate the Labour day last Friday, we had BBQ at our house with some friends. It was kind of a last minute decision because we were waiting to see if it was finally going to stop raining. The minute everyone confirmed they were coming, I was in the kitchen, to bake a dessert, of course. What’s the quickest thing to make, that everyone will love??? 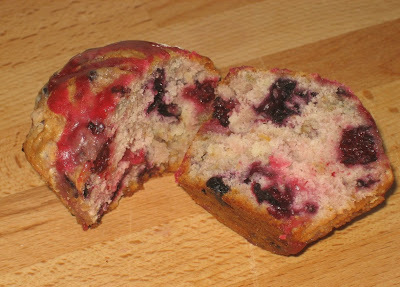 It took me a minute to decide really, I ran back to my computer and printed the recipe I saw the day before on Spryte’s place – it was a recipe for Bright Blueberry muffins. I didn’t have any blueberries, but I did have some mixed wild berries in my freezer that I was dying to use. Everyone loved them, and they disappeared in no time. Too quickly I’d say, since I managed to eat only one of those. 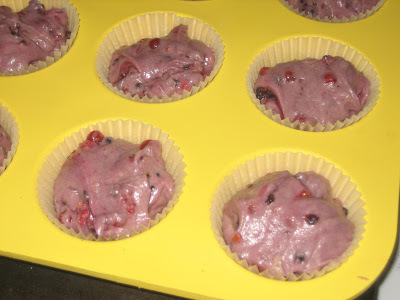 Well, I couldn’t rest till I made them again – wild berries were on my shopping list the day after, and I started baking more muffins yesterday. I said before that everyone liked them – not exactly. Everyone except my husband. Simply because he doesn’t like berries. So I knew what was coming when he came into the kitchen yesterday – won’t you make some really good muffins? Why don’t you add Nutella? Ok, I didn’t give up on my wild berries, I made a double batch and then made one half with berries and the other half with Nutella and chocolate. When I made these on Friday, I was so much in a hurry, that I added 2 tblspoons of butter instead of 1/2C – they were still good. The softest muffins I’ve ever had. Definitely my favourite from now on. Another compliment came from a friend who came over yesterday for pizza and football match on TV. 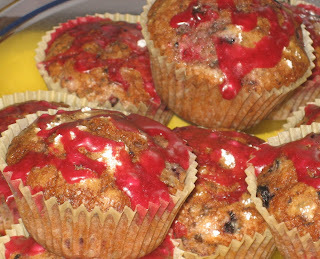 He said he had tried lots of different muffins during his stay in England – home made and not – but never this good. Thanks again, Spryte, for sharing this recipe. To check Spryte’s recipe click HERE. And this is my translation into metric system (I didn’t simply use the conversion chart, but actually measured with cup measurer and then weighed everything). For chocolate muffins I added 4 tablespoons Nutella and 50 g melted chocolate, and vanilla extract instead of lemon zest. 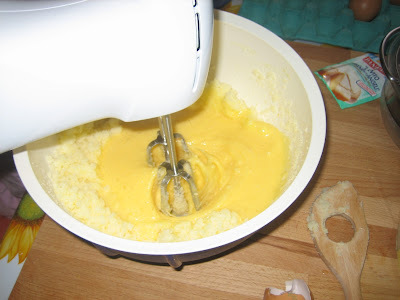 In a mixing bowl cream butter and sugar. 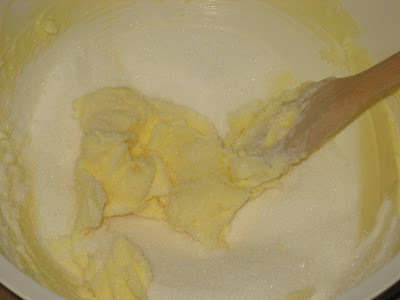 I started working butter with a wooden spoon but found it too hard and therefore continued with an electric mixer. 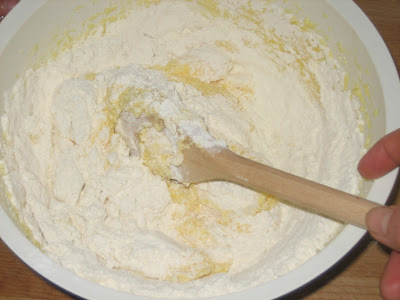 Sift flour, baking powder and salt together and add to the batter alternating with milk. 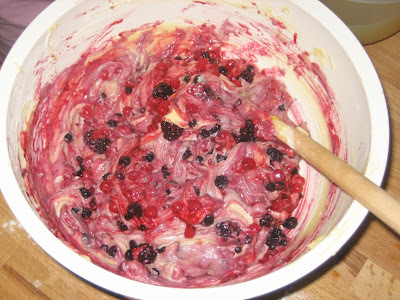 Mash 100 g of berries with a fork and add to the batter together with the lemon zest. Stir in the rest of the berries. 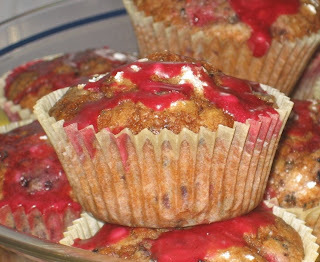 Fill muffin cups and sprinkle with powdered sugar. Bake in an oven preheated to 190°C for about 20 minutes or until a tooth pick comes out clean (unless you stick it into a berry, that is to say). If you too have berry haters/chocolate lovers do like I did – add Nutella and melted chocolate to the batter and bake in the same way. Za ovaj recept iskoristila sam recept za Muffine s borovnicama koje sam zamijenila mješavinom šumskog voća. Izvrsni su, sočni, mekani i jako ukusni. 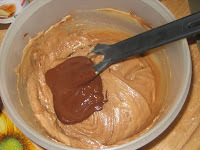 Ako niste ljubitelji šumskog voća, zamijenite voće Nutellom ili otopljenom čokoladom. Drvenom kuhačom ili električnim mikserom dobro izmiješajte maslac sa šećerom. Dodajte jedno po jedno jaje i dobro izmiješajte. Prosijte skupa brašno, prašak za pecivo i sol pa dodajte u smjesu naizmjenično s mlijekom. Vilicom smrvite oko 100 g voća pa umiješajte u smjesu. Dodajte potom i limunovu koricu i ostatak cijelog voća (ako koristite smrznuto voće, ostavite ga u cjedilu da se dobro ocijedi sok). Izmiješajte sve i napunite papirne čašice za muffine. Pospite s malo mljevenog šećera i pecite u pećnici zagrijanoj na 190°C. Po želji pomiješajte 2 žlice soka od voća s toliko mljevenog šećera da dobijete gusti sirup i malo ukrasno nalijte po ispečenim kolačima. Za čokoladne sam muffine dodala u istu smjesu (osim voća) 4 žice Nutelle i 50 g otopljene čokolade, i ispekla ih na isti način. 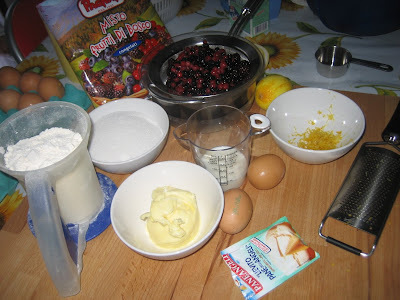 Qualche giorno fa ho trovato su un' altro blog questa ricetta per I muffin ai mirtilli, ed ero sicura che l'avrei provata subito. Però, per i mirtilli bisogna aspettare ancora un po' ed io avevo dei frutti di bosco congelati che volevo sfruttare. É nato un felice matrimonio. Morbidi e deliziosi, mi hanno conquistato subito, tanto che ho dovuto rifarli per soddisfare la mia golosità. E poi ho fatto anche i muffin al cioccolato e Nutella con la stessa ricetta (sostituendo i frutti di bosco con 4 cucchiai di Nutella e 50 g di cioccolato), per Gaetano (mio marito) – una domenica con i muffin, insomma. Mescolate bene il burro con lo zucchero (con un cucchiaio di legno o con la frusta elettrica) finché diventi cremoso. Aggiungete le uova, uno alla volta. Aggiungete la farina che avete setacciato insieme al lievito e il sale, alternando con il latte. Schiacciate 100 g di frutti di bosco con una forchetta e unite al composto insieme al resto della frutta e la scorza di limone. 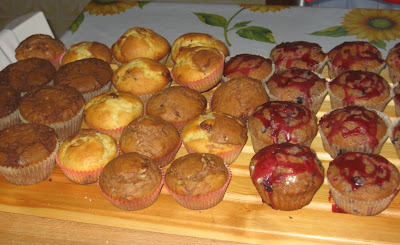 Riempite i stampini per i muffin, spolverizzate con un po' di zucchero a velo e cuocete nel forno preriscaldato a 190°C per circa 20 minuti o finché lo stuzzicadenti non esce pulito. Those look amazing! I love homemade muffins. I love both versions!! Especially the Nutella ones, my downfall! Both sets of muffins look wonderful. But those nutella ones, OMG, I would be running to those for sure. Those look awesome!! Tawny and I both agree we think we'd like yours better with mixed berries and/or Nutella!